Background: Pancreatic stellate cells (PSCs), implicated as key mediators of pancreatic fibrogenesis, are found in increased numbers in areas of pancreatic injury. This increase in PSC number may be due to increased local proliferation and/or migration of these cells from adjacent areas. The ability of PSCs to proliferate has been well established but their potential for migration has not been examined. Aims: Therefore, the aims of this study were to determine whether cultured rat PSCs have the capacity to migrate and, if so, to characterise this migratory capacity with respect to the influence of basement membrane components and the effect of platelet derived growth factor (PDGF, a known stimulant for migration of other cell types). Methods: Migration of freshly isolated (quiescent) and culture activated (passaged) rat PSCs was assessed across uncoated or Matrigel (a basement membrane-like substance) coated porous membranes (pore size 8 μm) in the presence or absence of PDGF (10 and 20 ng/ml) in the culture medium. A checkerboard assay was performed to assess whether the effect of PDGF on PSC migration was chemotactic or chemokinetic. Results: Cell migration was observed with both freshly isolated and passaged PSCs. However, compared with passaged (culture activated) cells, migration of freshly isolated cells was delayed, occurring only at or after 48 hours of incubation when the cells displayed an activated phenotype. PSC migration through Matrigel coated membranes was delayed but not prevented by basement membrane components. PSC migration was increased by PDGF and this effect was predominantly chemotactic (that is, in the direction of a positive concentration gradient). Conclusions: (i) PSCs have the capacity to migrate. (ii) Activation of PSCs appears to be a prerequisite for migration. (iii) PDGF stimulates PSC migration and this effect is predominantly chemotactic. Implication: Chemotactic factors released during pancreatic injury may stimulate the migration of PSCs through surrounding basement membrane towards affected areas of the gland. Fibrosis is a key pathological feature of chronic pancreatitis1 and a major component of the prominent desmoplastic (stromal) reaction observed around the majority of pancreatic cancers.2 It is now generally accepted that fibrosis is an active dynamic process that is reversible in its early stages. The pathogenesis of pancreatic fibrosis has received increasing attention in recent years, largely due to the identification and characterisation of stellate cells in the pancreas.3,4 Data from both in vivo and in vitro studies3–5 indicate that these cells are similar in morphology and function to their hepatic counterparts which are well established as the principal effector cells in hepatic fibrosis.6 Evidence is now accumulating to support a key role for pancreatic stellate cells (PSCs) in pancreatic fibrogenesis.3–5,7–10 In the normal pancreas, PSCs are found in a periacinar and periductular location and manifest abundant vitamin A containing lipid droplets in their cytoplasm.3,4,11 Based on findings of recent in vitro studies,7,8,10 it is postulated that during pancreatic injury, PSCs are activated (by growth factors, proinflammatory cytokines, and oxidant stress) leading to the transformation of the cells into a myofibroblast-like phenotype that synthesises and secretes increased amounts of extracellular matrix proteins (particularly fibrillar collagens) that comprise fibrous tissue. In vivo studies using pancreatic tissue from patients with chronic pancreatitis as well as from experimental models of pancreatic fibrosis have demonstrated the presence of increased numbers of PSCs in fibrotic areas within the gland.5,9,12 This increase in PSC number could be due to two factors: (i) local proliferation of PSCs and (ii) recruitment of PSCs to affected areas from surrounding tissue. The ability of PSCs to proliferate when activated by factors such as platelet derived growth factor (PDGF) and proinflammatory cytokines is well documented.7,10 However, in contrast with the established migratory ability of hepatic stellate cells (HSCs),13,14 little is known of the capacity of PSCs to migrate within the pancreas. This study was designed to examine the migration characteristics of PSCs in vitro and to determine the influence of PDGF (a known chemotactic factor for other cell types)13,15–19 on PSC migration. All general chemicals were of analytical reagent grade and were purchased from Sigma Chemical Company (St Louis, Missouri, USA) as were all cell culture reagents. Collagenase P was purchased from Roche (Castle Hill, Sydney, Australia). Protease type XIV (from Streptomyces griseus) was obtained from Sigma Chemical Company. DNase was purchased from Pharmacia Biotech (Uppsala, Sweden). Nycodenz was obtained from Nycomed Pharma AS (Oslo, Norway). Iscove’s modified Dulbecco’s medium (IMDM) was purchased from Invitrogen Pty Ltd (Melbourne, Australia). Cell culture inserts with porous membranes and companion culture plates were purchased from Becton-Dickinson (Bedford, Massachusetts, USA). Human recombinant PDGF BB was purchased from Sigma Chemical Company. Rat PSCs were isolated as described previously3 using a Nycodenz gradient. This method yields a stellate cell preparation of 95–97% purity with negligible contamination by other cells. Migration studies were performed with freshly isolated (quiescent) cells, as well as with passaged cells (passage 1–3), using cell culture inserts (Becton-Dickinson) placed in 12 well culture plates. The base of the inserts consisted of an uncoated porous membrane (pore size 8 μm, membrane diameter 10.5 mm). PSCs suspended in IMDM were placed in the inserts (30 000 cells/insert) and the inserts in turn were placed in culture wells containing the same medium. Cells were cultured for periods of 12, 24, 48, and 72 hours at 37°C. At the end of the incubation period, culture medium was removed and the cells adherent to the membrane were fixed in 100% methanol and subjected to Giemsa staining.20 Briefly, membranes treated with 100% methanol for 20 minutes were air dried and stained for five minutes in May Grunwald’s solution. This was followed by immersion of the membranes in dilute Giemsa solution for 25 minutes and washing with buffered distilled water (pH 6.8) for a further 60 seconds. Membranes were then rinsed in tap water for 60 seconds, mounted on glass slides, covered with glass cover slips, and examined by light microscopy. For each membrane, five non-contiguous randomly selected microscopic fields were examined using an Olympus BX60 microscope and a ×40 objective. By changing the focus of the objective, images (magnification 400×) of Giemsa stained cells on the upper surface and undersurface of the membrane in the same microscopic field were captured with a Spot Cooled Color Digital camera that had been calibrated with a reference measurement slide (Diagnostic Instruments, Sterling Heights, Michigan, USA). The narrow depth of field of the ×40 objective readily permitted differentiation between the upper and undersurface of the membranes. Once all of the images were acquired, the number of cells on the upper surface and undersurface of the membrane in the same microscopic field were counted and the cell number per mm2 of membrane was calculated. The rate of migration of PSCs was expressed as a migration index (%): (number of cells on the undersurface of the membrane divided by the total number of cells on both surfaces of the membrane)×100. Assessment of cell migration by the above method may be confounded by two factors: (a) difference in the rate of proliferation of PSCs on the two surfaces of the membrane and (b) the effect of gravity. To address these factors, cell proliferation on both surfaces of the membrane was assessed by an in situ proliferation assay, while the effect of gravity was examined by assessing PSC migration after inversion of the inserts in the culture wells. An in situ assay was used to assess cell proliferative activities on both sides of the membrane.14 This method involves labelling of cell nuclei with 5-bromo-2′-deoxyuridine (BrdU; Sigma Chemical Co). Briefly, PSCs were incubated in culture medium containing 5×10−5 M BrdU for 16 hours. Cells were then washed in cold phosphate buffered saline (PBS) and fixed in ethanol:acetic acid (95:5 vol/vol) for 30 minutes at 37°C. DNA from fixed cells was denatured using formamide dissolved in 0.8 M NaCl, 20 mM Tris HCl (pH 8.0) for 45 minutes at 70°C. Cells were then washed and incubated with a monoclonal antibody for BrdU (1:100; Dako Corporation, Carpintaria, California, USA) for one hour at room temperature followed by incubation with a biotinylated secondary antibody (1:100; Dako Corporation) for one hour at room temperature. After washing in PBS, cells were incubated with an avidin-biotin-peroxidase complex (ABC Kit, Vector Laboratories, Burlingame, California, USA). Immunocomplexes were visualised by diaminobenzidine staining (Sigma Chemical Company). Five randomly selected fields were examined and the number of BrdU positive cells on the upper surface and undersurface of the membrane in these fields was counted. Data are expressed as the proportion of BrdU positive cells on each side of the membrane. To examine the possibility that any observed movement of cells from the upper to the undersurface of the membrane may be gravity dependent, the migration assay was repeated with inversion of the inserts in the culture medium. Briefly, cells were seeded into the inserts as before (30 000 cells/insert) and allowed to adhere to the membrane for three hours at 37°C. The insert was then inverted in the culture wells and incubated for a further 9 or 21 hours. At the end of the incubation, membranes were subjected to Giemsa staining and cells on both surfaces of the membranes counted as described above. For any migration observed in vitro to be relevant to the in vivo situation (where PSCs are embedded in extracellular matrix), it was necessary to confirm that PSCs retain their migratory capacity in the presence of ECM components. Therefore, additional migration studies were performed using inserts with membranes coated with Matrigel (pore size 8 μm, membrane diameter 6.4 mm). For these experiments, PSCs were seeded into Matrigel coated inserts (3000 cells per insert) and incubated as above for 12, 24, 48, and 72 hours. Cells seeded into inserts with uncoated membranes (pore size 8 μm, membrane diameter 6.4 mm) were used as controls. Membranes were subjected to Giemsa staining and the migration index calculated as described above. The effect of PDGF BB (one of the three isoforms of PDGF) on the rate of migration of PSCs was examined by seeding the cells on uncoated porous membranes followed by incubation (for 12 or 24 hours) in medium containing PDGF at concentrations of 10 and 20 ng/ml. Cells incubated in medium without PDGF served as controls. Selection of the isoform PDGF BB for these experiments was based on the fact that PSCs are known to express the receptor for this isoform on the cell surface5 and have been reported to respond to the isoform by proliferation.7 Furthermore, Ikeda and colleagues14 have demonstrated that PDGF BB stimulates the migration of HSCs. At the end of the incubation period with or without PDGF, PSCs on both surfaces of the membranes were Giemsa stained and the migration index assessed as noted previously. As PDGF is a known mitogenic factor for PSCs, proliferation rates of PDGF treated cells were also assessed using BrdU incorporation, as detailed above. To determine whether the effect of PDGF on PSC migration was predominantly chemotactic (in the direction of a positive concentration gradient) or chemokinetic (independent of a concentration gradient), checkerboard migration assays were performed whereby different concentrations of PDGF were introduced into the upper and lower chambers of the insert assembly (as detailed in table 1). Briefly, PSCs were seeded into inserts with uncoated membranes and allowed to settle for 30 minutes. PDGF was introduced into the upper and lower chambers of the insert assembly to give the final concentrations shown in table 1 for each well. Cells were incubated further for a total of nine hours (this relatively short incubation period was selected to minimise any confounding effect of the loss of the PDGF concentration gradient across the porous membranes). At the end of the incubation period, cells were stained using Giemsa stain and examined by light microscopy to assess migration indices according to methods described earlier. Rates of cell proliferation were also assessed using the BrdU incorporation assay to correct for any differences in proliferation (due to the differing concentrations of PDGF on the two sides of the porous membrane) that could have confounded calculation of the migration index. Results are expressed as means (SEM) of 3–4 separate cell preparations per experimental protocol. Data were analysed using the Student’s paired t test. The checkerboard experiment data were analysed using Wilcoxon’s signed rank test. Using culture activated (passaged) PSCs, migration was evident across uncoated porous membranes after 12 hours of incubation. The migration index increased over an incubation period of 48 hours (fig 1). Migration was also observed in experiments using freshly isolated cells, but this was delayed compared with passaged cells, and was first evident after 48 hours of incubation (fig 1). The delayed migration of freshly isolated PSCs was of interest, given that the time point of 48 hours coincides with the first appearance of expression of α smooth muscle actin (α-SMA, a contractile cytoskeletal protein) in freshly isolated cells cultured on plastic.3 These findings suggest that transformation to an activated phenotype may be a prerequisite for PSC motility. Migration of pancreatic stellate cells (PSCs) (n=4 separate cell preparations). Culture activated (passaged) PSCs demonstrated migration across uncoated porous membranes as early as at 12 hours of incubation with an increase in the migration index over the incubation period of 48 hours. Compared with passaged cells, migration of freshly isolated cells was delayed and was first detected after 48 hours of incubation. To determine whether gravity may have a confounding effect on PSC migration studies, passaged cells were incubated for 12 and 24 hours on uncoated porous membranes in inserts that were inverted after cell seeding. These studies demonstrated that PSCs in inverted inserts continued to migrate at a rate comparable with upright inserts (fig 2), indicating that PSC migration was independent of gravity. Effect of gravity on pancreatic stellate cell (PSC) migration. Passaged cells (n=3 separate cell preparations) were seeded into inserts with porous membranes and the inserts were then inverted. The rate of migration of PSCs in inverted inserts was comparable with that observed with PSCs in upright inserts at both 12 and 24 hours of incubation, indicating that migration of PSCs across the porous membranes was independent of gravity. Cell proliferation assays using BrdU demonstrated that the rates of cell proliferation on the top and undersurface of the membranes after 24 hours of incubation were similar (BrdU incorporation in 42.3 (0.8)% and 43.8 (1.2)%, respectively; n=3 separate cell preparations), indicating that the observed increase in migration index over time could not be attributed to differences in proliferation of cells on the different sides of the membranes. Migration of PSCs through Matrigel coated porous membranes was first observed after 48 hours of incubation and the migration index was found to increase over a further 24 hours of incubation (fig 3). 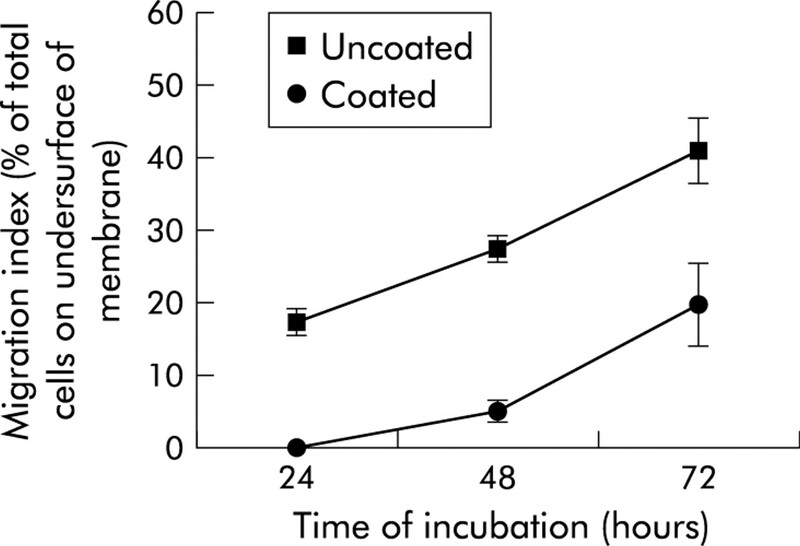 Compared with PSC migration through uncoated membranes, migration through coated membranes was delayed and the migration index at 48 and 72 hours of incubation was significantly lower (fig 3). To ensure that the absence of migration at 24 hours was not due to impaired adhesion of cells to the Matrigel coated surface, total cell numbers on the entire membrane (upper and undersurface) at 24 hours were calculated for coated and uncoated membranes. The data (11 004 (396) cells for uncoated membranes and 11 307 (1519) cells for Matrigel coated membranes; p=0.46, n=3 separate cell preparations) indicate that Matrigel coating did not adversely affect the settling and adhesion of cells on the membranes. Pancreatic stellate cells (PSC) migration through Matrigel coated porous membranes. Migration of culture activated PSCs (n=3 separate cell preparations) across uncoated porous membranes was compared with that across membranes coated with Matrigel, a basement membrane-like substance (to simulate in vivo conditions). PSC migration was delayed but not prevented by the Matrigel coating on the membranes, indicating that PSCs retain their capacity to migrate when surrounded by basement membrane components. p<0.001, p<0.035, and p<0.02, uncoated versus coated membranes at 24, 48, and 72 hours, respectively. Incubation of PSCs in culture medium containing PDGF (10 ng/ml and 20 ng/ml) for 12 hours resulted in statistically significant increases in their migration indices compared with control cells (fig 4). This effect was maintained, but not enhanced, by incubation with PDGF for a longer period of 24 hours. PDGF at a concentration of 20 ng/ml did not increase migration rates above those observed with PDGF at a concentration of 10 ng/ml. After 24 hours of incubation, BrdU incorporation in cells treated with or without 10 ng/ml PDGF was as follows: % BrdU incorporation in cells without PDGF, 51.4 (6.4)% on the top of the membrane and 53.3 (9.8)% on the undersurface of the membrane (p=0.66); % BrdU incorporation in cells with PDGF, 60.5 (7.3)% on the top of the membrane and 52.3 (7.2)% on the undersurface of the membrane (p=0.11); n=5 separate cell preparations. Effect of platelet derived growth factor (PDGF) on pancreatic stellate cell (PSC) migration (n=4 separate cell preparations). 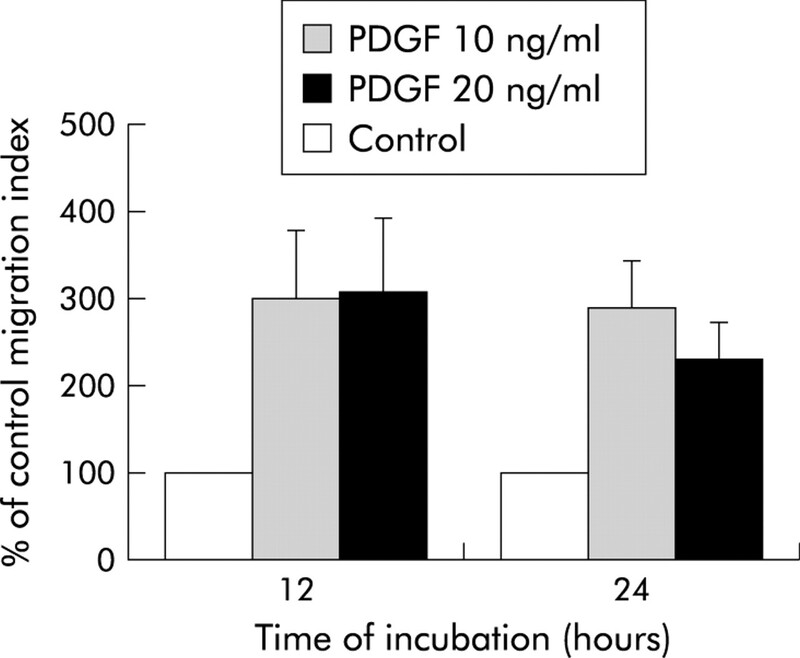 The presence of 10 ng/ml or 20 ng/ml of PDGF in the culture medium significantly increased the rate of migration of PSCs at both 12 and 24 hours of incubation compared with control cells not exposed to PDGF. The magnitude of induction of migration (compared with controls) was similar for the two concentrations of PDGF used. p<0.01, PDGF 10 ng/ml versus controls and PDGF 20 ng/ml versus controls at 12 hours; p<0.05, PDGF 10 ng/ml versus controls and PDGF 20 ng/ml versus controls at 24 hours. Increasing concentrations of PDGF in the lower chamber relative to the upper chamber led to increasing rates of migration of PSCs (table 2), suggesting that PDGF has a chemotactic effect on cells. At the same time, the migration index of PSCs incubated with PDGF (for example 10 ng/ml in both the upper and lower chambers) was higher than PSCs not incubated with PDGF in either chamber, confirming that PDGF also exerts a chemokinetic effect on PSCs. However, the increase in PSC migration in the presence of a concentration gradient was higher than that in the absence of a gradient, suggesting that PDGF exerts a predominantly chemotactic effect on PSCs. No differences were observed in the proportion of BrdU incorporation into the DNA of cells on the two sides of the membrane in each well of the checkerboard experiments (data not shown). Lack of a difference in proliferation of cells exposed to different concentrations of PDGF on the two sides of the membrane may be explained by the relatively short incubation period employed for the checkerboard assays. This study has demonstrated, for the first time, that rat PSCs are capable of migration. This capacity is retained in the presence of Matrigel (a basement membrane-like compound) and is enhanced by the known chemotactic factor PDGF. In vivo studies using pancreatic tissue from patients with chronic pancreatitis5,9 and from experimental models of pancreatic fibrosis5,12,21,22 have demonstrated the presence of increased numbers of PSCs in areas of injury. Accumulation of PSCs in affected areas may result from increased local proliferation of PSCs as well as from migration of PSCs to areas of injury from surrounding areas. The ability of PSCs to proliferate in response to growth factors, proinflammatory cytokines, and oxidant stress (all of which are known to be upregulated during pancreatic necroinflammation9,23–29) is well established.4,7,10,30 The present study provides evidence in support of cell migration as an additional explanation for PSC accumulation in areas of injury. Freshly isolated PSCs exhibited delayed migration compared with culture activated PSCs. This finding concurs with that reported for HSCs.14 The incubation time of 48 hours at which migration was first observed in freshly isolated PSCs corresponds closely with the time that α-SMA expression first becomes evident in cultured PSCs,3 suggesting that an activated phenotype may be a prerequisite for PSC migration. The method employed in this study to assess cell migration is prone to two potentially confounding influences: (i) the effect of gravity and (ii) differences in rates of cell proliferation on the two surfaces of the membrane. Using inverted cell culture inserts to neutralise the effect of gravity, we have demonstrated that PSCs retained their capacity to migrate against gravity. Furthermore, the rate of migration using inverted inserts was found to be similar to that observed with upright inserts. Rates of cell proliferation (as assessed by incorporation of BrdU into cellular DNA) on the two sides of the membrane were also found to be similar indicating that the calculated migration indices reflected true migration rates and were not confounded by unequal proliferation of cells on the different sides of the membranes. The reasons for the observed delay in PSC migration through Matrigel are unclear. It may be that a combination of factors contribute to this observation. Induction of quiescence by Matrigel. Studies with HSCs,31 and more recently with PSCs,32 have demonstrated that culture on basement membrane components induces a reversal of cell phenotype from an activated to a quiescent state. Thus Matrigel induced PSC quiescence may account for the observed delay in cell migration through coated membranes. This concept is supported by our findings with freshly isolated PSCs which suggest that activation may be a prerequisite for migration. Altered integrin expression and focal adhesion complex formation in the presence of Matrigel. Studies with HSCs have shown that cell surface integrin binding and the assembly of focal adhesions are altered by extracellular matrix components.33 Thus Matrigel induced changes in PSCs with respect to these factors may affect the migratory capacity of PSCs. Requirement for degradation of Matrigel prior to migration. Degradation of surrounding matrix components would be a prerequisite for PSC migration through Matrigel coated porous membranes. It is now known that PSCs can synthesise and secrete a number of matrix degrading enzymes, prominent among which is the matrix metalloproteinase 2 known to digest basement membrane collagen (type IV).34,35 Delayed migration through coated membranes may reflect the time required for matrix metalloproteinases secreted by cultured PSCs to digest the surrounding matrix. While the proliferative effect of PDGF on PSCs has been well established,7,10 the current study is the first to demonstrate that PDGF also induces PSC migration and that this effect is predominantly chemotactic. Both responses (cell proliferation and migration) are likely mediated via the binding of PDGF to specific receptors on the surface of PSCs. In this regard, we and others have previously demonstrated the presence of PDGF receptors on cultured PSCs.7,10 Furthermore, in vivo studies have reported increased PDGF receptor expression in human as well as in experimental chronic pancreatitis in areas adjacent to pancreatic fibrosis and in a distribution coinciding with the location of stellate cells,5,9 suggesting that during pancreatic injury, the responsiveness of PSCs to PDGF may be increased. Another factor of relevance to the in vivo situation is the known upregulation of the PDGF ligand itself in areas of pancreatic injury.9,29 It would not be unreasonable therefore to suggest that during pancreatic injury, release of PDGF in injured areas has two effects: (i) a proliferative effect on local PSCs and (ii) a chemotactic effect on PSCs surrounding the affected area. In summary, this work describes a novel aspect of pancreatic stellate cell biology—namely, the migratory capacity of PSCs and its stimulation by platelet derived growth factor. These findings support the concept that soluble mediators released during pancreatic injury may recruit stellate cells to areas of injury. Studies described in this manuscript were supported by grants from the National Health and Medical Research Council of Australia, the Department of Veterans’ Affairs, Australia, and the Australian Brewers’ Foundation. DiMagno EP, Layer P, Clain JE. Chronic pancreatitis. In: Go VLW, DiMagno EP, Gardner JD, et al, eds. The Pancreas: Biology, Pathobiology and Disease. New York: Raven Press, 1993:665–706. Kloppel G. The Pancreas: Biology, Pathobiology and Disease. New York: Raven Press, 1993. Apte MV, Haber PS, Applegate TL, et al. Periacinar stellate shaped cells in rat pancreas—identification, isolation, and culture. Gut1998;43:128–33. Bachem MG, Schneider E, Gross H, et al. Identification, culture, and characterization of pancreatic stellate cells in rats and humans. Gastroenterology1998;115:421–32. Haber PS, Keogh GW, Apte MV, et al. Activation of pancreatic stellate cells in human and experimental pancreatic fibrosis. Am J Pathol1999;155:1087–95. Friedman SL. Molecular regulation of hepatic fibrosis, an integrated cellular response to tissue injury. J Biol Chem2000;275:2247–50. Apte MV, Haber PS, Darby SJ, et al. Pancreatic stellate cells are activated by proinflammatory cytokines: Implications for pancreatic fibrogenesis. Gut1999;44:534–41. Apte MV, Phillips PA, Fahmy RG, et al. Does alcohol directly stimulate pancreatic fibrogenesis? Studies with rat pancreatic stellate cells. Gastroenterology2000;118:780–94. Casini A, Galli A, Pignalosa P, et al. Collagen type I synthesized by pancreatic periacinar stellate cells (PSC) co-localizes with lipid peroxidation-derived aldehydes in chronic alcoholic pancreatitis. J Pathol2000;192:81–9. Schneider E, Schmid-Kotsas A, Zhao J, et al. Identification of mediators stimulating proliferation and matrix synthesis of rat pancreatic stellate cells. Am J Physiol Cell Physiol2001;281:C532–43. Ikejiri N. The vitamin-A storing cells in the human and rat pancreas. Kurume Med J1990;37:67–81. Emmrich J, Weber I, Sparmann GH, et al. Activation of pancreatic stellate cells in experimental chronic pancreatitis in rats. Gastroenterology2000;118:A166. Marra F, Gentilini A, Pinzani M, et al. Phosphatidylinositol 3-kinase is required for platelet-derived growth factor’s actions on hepatic stellate cells. Gastroenterology1997;112:1297–306. Ikeda K, Wakahara T, Wang YQ, et al. In vitro migratory potential of rat quiescent hepatic stellate cells and its augmentation by cell activation. Hepatology1999;29:1760–7. Grotendorst GR, Chang T, Seppa HE, et al. Platelet-derived growth factor is a chemoattractant for vascular smooth muscle cells. J Cell Physiol1982;113:261–6. Siegbahn A, Hammacher A, Westermark B, et al. Differential effects of the various isoforms of platelet-derived growth factor on chemotaxis of fibroblasts, monocytes, and granulocytes. J Clin Invest1990;85:916–20. Kundra V, Escobedo JA, Kazlauskas A, et al. Regulation of chemotaxis by the platelet-derived growth factor receptor-beta. Nature1994;367:474–6. Iguchi I, Kamiyama K, Wang X, et al. Enhancing effect of platelet-derived growth factors on migration of corneal endothelial cells. Cornea1995;14:365–71. Kamiyama K, Iguchi I, Wang X, et al. Effects of PDGF on the migration of rabbit corneal fibroblasts and epithelial cells. Cornea1998;17:315–25. Dacie JV, Lewis SM. Practical Haematology, 6th edn. Edinburgh: Churchill Livingstone, 1984. Neuschwander-Tetri BA, Burton FR, Presti ME, et al. Repetitive self-limited acute pancreatitis induces pancreatic fibrogenesis in the mouse. Dig Dis Sci2000;45:665–74. Vogelmann R, Ruf D, Wagner M, et al. Effects of fibrogenic mediators on the development of pancreatic fibrosis in a TGF-beta1 transgenic mouse model. Am J Physiol Gastrointest Liver Physiol2001;280:G164–72. Schoenberg MH, Buchler M, Gaspar M, et al. Oxygen free radicals in acute pancreatitis of the rat. Gut1990;31:1138–43. Niederau C, Niederau M, Borchard F, et al. Effects of antioxidants and free radical scavengers in three different models of acute pancreatitis. Pancreas1992;7:486–96. Gress T, Muller-Pillasch F, Elsasser HP, et al. Enhancement of transforming growth factor beta 1 expression in the rat pancreas during regeneration from caerulein-induced pancreatitis. Eur J Clin Invest1994;24:679–85. Van Laethem JL, Marchant A, Delvaux A, et al. Interleukin 10 prevents necrosis in murine experimental acute pancreatitis. Gastroenterology1995;108:1917–22. Van Laethem JL, Deviere J. Pancreatitis and cytokines. Acta Gastroenterol Belg1996;59:186–7. Norman J. The role of cytokines in the pathogenesis of acute pancreatitis. Am J Surg1998;175:76–83. Ebert M, Kasper HU, Hernberg S, et al. Over expression of platelet-derived growth factor (PDGF) b chain and type beta PDGF receptor in human chronic pancreatitis. Dig Dis Sci1998;43:567–74. Mews P, Phillips P, Fahmy R, et al. Pancreatic stellate cells respond to inflammatory cytokines: Potential role in chronic pancreatitis. Gut2002;50:535–41. Friedman SL, Roll FJ, Boyles J, et al. Maintenance of differentiated phenotype of cultured rat hepatic lipocytes by basement membrane matrix. J Biol Chem1989;264:10756–62. Fine DR, Bateman AC, McCrudden PR, et al. Factors influencing phenotypic expression and apoptosis of cultured pancreatic stellate cells. Gut1999;45(suppl V):A306. Marra F, Pastacaldi S, Romanelli RG, et al. Integrin-mediated stimulation of monocyte chemotactic protein-1 expression. FEBS Letters1997;414:221–5. Phillips PA, Pirola RC, McCaughan GW, et al. Pancreatic stellate cells secrete matrix metalloproteinases: implications for extracellular matrix turnover. Gut2002;52:275–82. Shek FW, Benyon RC, Walker FM, et al. Expression of transforming growth factor-beta 1 by pancreatic stellate cells and its implications for matrix secretion and turnover in chronic pancreatitis. Am J Pathol2002;160:1787–98.